The Clow Safety Harness 'Fall Arrest Single Webbing Kit' comes with Harness, Carabiner and Webbing Lanyard with Snap Hook and Energy Absorber, all supplied neatly and conveniently in a Clow Pro Bag. 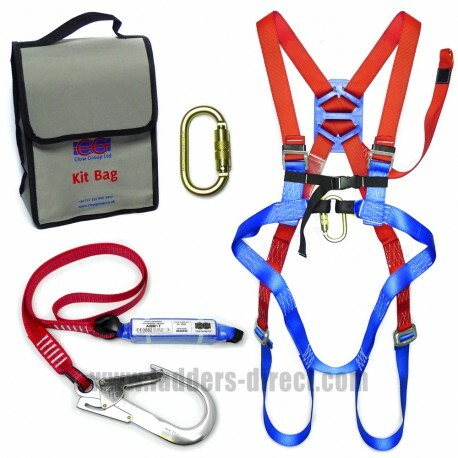 Energy Absorber with Single Webbing Lanyard & Snap Hooks (CEABM-T). Fitted to the rear buckle of the harness, the one metre single webbing lanyard comes with a snap hook for attaching to an anchor point and energy absorber, helping reduce the sudden impact that would occur if only a harness and lanyard were in use. Minimum ground clearance from anchorage point is 6.5m.